Of all the cities in Poland, Wrocław possesses perhaps the most convoluted and turbulent history of them all. Known under dozens of different names as it was passed repeatedly between four countries (and the numerous kingdoms that preceded them), Wrocław was one of the most culturally and architecturally diverse cities in Central Europe before being reduced to rubble a mere 65 years ago. As the city proudly and painstakingly rebuilt itself, the post-war period saw a new wave of migrants from today’s western Ukraine enrich not only Wrocław’s ethnic makeup, but also its cultural wealth as many cultural treasures from Lwów were transplanted here. Since shedding the yoke of communism in 1989 and being ‘rediscovered’ by the west, Wrocław has firmly established itself among Prague and Kraków as one of Eastern Europe’s top tourist destinations and one of the undisputed highlights of Poland. If we think about Wrocław’s city centre in terms of districts, there are three essential areas that visitors shouldn’t allow themselves to miss. The first is obviously the Old Town, with the marvellously restored Market Square at its centre and its maze of cobbled streets, canals, bridges and church spires. Essentially bound by the Odra River to the north and the Fosa Miejska – or city moat – to the south, this area that was once encircled by the city’s medieval defensive walls is where you’ll find the bulk of Wrocław’s historical monuments and museums, as well as many beautiful University buildings, soaring churches, and the city’s infamous gnomes. The Old Town also includes the ‘District of Mutual Respect’ – a unique neighbourhood southwest of the market square which includes almost side by side the places of worship of four different denominations, including the city’s only surviving Jewish synagogue. The Old Town may be the heart of Wrocław, but its soul is in Ostrów Tumski. This ‘Cathedral Island’ within easy walking distance northeast of the market square was the first part of Wrocław to be settled by Slavic tribes in the 9th century. Since a bishopric was built there in 1000AD it has remained an important place of royal and religious significance, and home to the city’s most important Cathedral. Finally, no visit to Wrocław is complete without a trip east of the Old Town to Centennial Hall. The city’s only UNESCO World Heritage site, this outstanding piece of architecture turned 100 in 2013 and is surrounded by beautiful parks and gardens, including Wrocław’s Zoo and a spectacular multimedia fountain (which turns into an ice rink in winter). 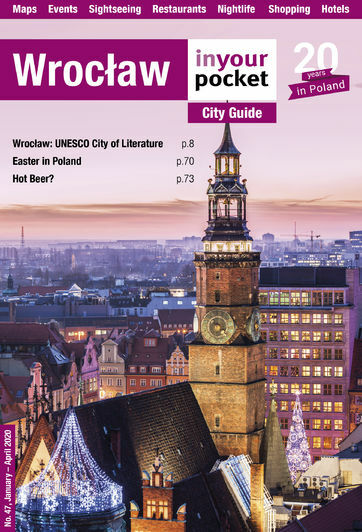 If your stay in the area is an extended one, within this section you’ll also find pages devoted to worthwhile daytrips outside of Wrocław including Żagań, the peace churches in Jawór and Świdnica, and Książ Castle. No matter how much time you have, the meticulously updated information in this guide will help you make the most of it. Enjoy exploring Wrocław and Lower Silesia.